Replacing stair carpet with oak treads, any advice? 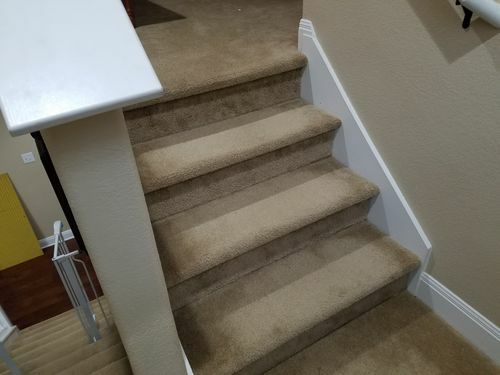 When we had this house built 5 years ago, the cost to do the stairs beyond carpet was extremely high. I am wanting to strip the carpet and install oak treads with the wood I have. 1. 389bf of 6/4 red oak. These boards are roughly 9.5” wide and 8-12’ long. This wood is already finished as it came out of the local courthouse from a remodel. It is at least 50 years old, likely older, when I stuck my moisture meter to it, it was about 6%. 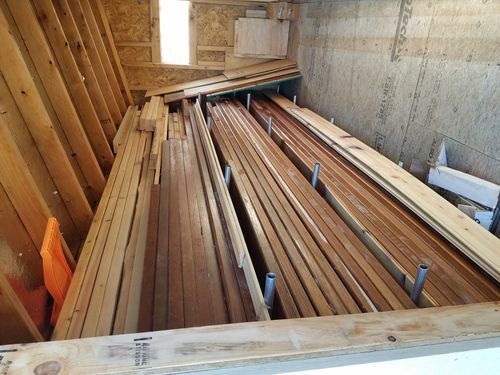 The contractor hooked me up, gave it to me for free and I have it stored in a lumber rack. 2. Tons of wrought iron balusters, which I got from CL along with 30 large polyurethane balusters. Total of 55 solid wrought iron and 22 poly balusters all for $80. My thinking is since the treads need to be a minimum of 11” deep, I will need to rip them and join each plank to maybe 11.5” deep and cut them to a bit longer than final tread length. Run through jointer and plane down to finished thickness? I have read that minimum tread thickness should be no less than 1”, but 1.5” is probably too thick? The bottom couple of treads flare out wide and would be hard to join up as is, at least with my experience. I was thinking I could trace out the current builder grade tread and lay that onto a large enough piece of joined wood and cut it out as one piece with a jigsaw or scrollsaw, then clean it up. Would appreciate your thoughts and advice. That is one heck of a sweet deal on the oak. Are you certain it is really 389 board feet? From the picture I would have guessed 390. Seriously, your plan sounds like a winner. You have plenty of stock to get as fussy as you want with matching grain. You didn’t include a picture of the bottom flared treads. Your idea sounds OK, but if you add a picture someone might offer some alternatives. You mentioned that the wood is already finished. I assume that you will not be trying to keep that old finish in the project. Haha yeah, I measured everyboard as I brought it in and it came out to 389bf and change. I have gone through it meticulously and ensured there were no nails/screws in it. The contractor told me it was all screws and they took them out rather than cutting the boards off with a sawzall or cutoff tool. I do plan on stripping the wood and refinishing it to match our hardwood floors as close as I can. Although I am not certain of the best order in doing that, finish once installed or preinstall? If I was painting them, I would definitely paint first, install then touch up as needed, but not easy to touch up stain if I mess it up during install. I will get some pics of the stairs after work and would definitely appreciate advice on this. I am under no delusion of this being a quick weekend project and will take my time to make sure the results are nice. 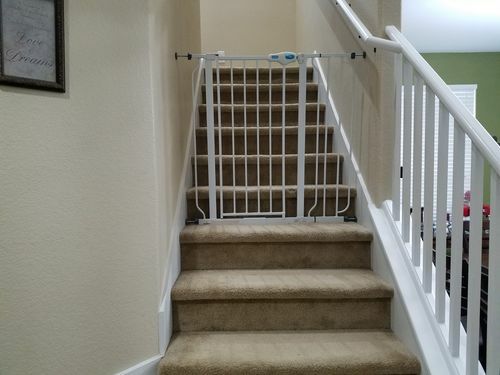 We no longer have kids at home and the only thing upstairs is our home theater, my office and a restroom, so we can get along fine with incomplete stairs for a bit. Also, was thinking it may not be a bad idea to remove and replace one tread and riser at a time, if that doesn’t present any issues I am unaware of. 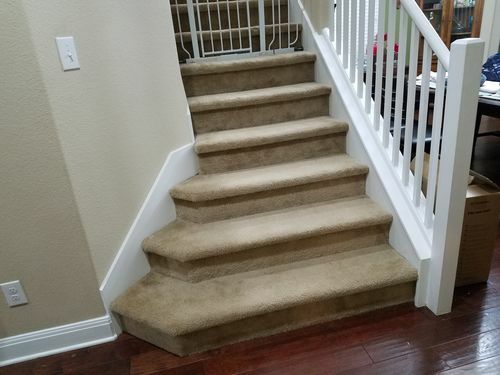 Are you removing the existing plywood treads and the carpet? Only thing I can add is the height of your first and last step are already sized for plywood and carpet, so you don’t want to go too far away from this size or you change the first step and the last. I did something similar many years ago. Most of my steps were captured on both sides by walls. That is the project where I learned the value of a sliding story stick. I pre-finished all the treads and had just enough stock to do the project. No margin for error on the cuts. One tread at a time, each measured with a sliding story stick I made out of tongue and groove cutoffs. Slide the stick out to touch the walls, clamp it, then take it to the tread and the saw. Repeat. 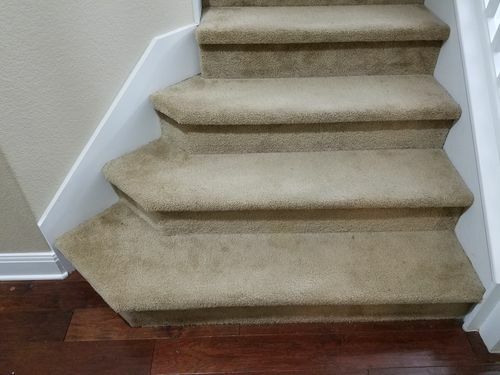 Are you removing the existing plywood treads and the carpet? Only thing I can add is the height of your first and last step are already sized for plywood and carpet, so you don t want to go too far away from this size or you change the first step and the last. Yes sir, that is the plan, take it down to the stringers. I am planning on using my PM 18” bandsaw to cut the same wood into 2 or 3 thinner pieces and plane to thickness to make just enough flooring for the landing. Treads can be as thick as u want, but as blue mentioned sticking with same as what was on there (usually 1 1/8)is easiest. Appreciate the response guys, here are a few pics of what I am dealing with. I didn’t realize the stair ends wouldn’t be squared off, due to the wall o either side? They will be square in a framing sense, but not in a finish carpentry sense. Most wooden treads are fit exact, so you may have .5 to 1 degree variation that you want to account for as there will be no molding, so a perfect gap free fit is what you are after. The wall boards are in theory parallel, but in practice they won’t be, but the jig I linked to is the simple solution to getting a gapless fit. They will be square in a framing sense, but not in a finish carpentry sense. Most wooden treads are fit exact, so you may have .5 to 1 degree variation that you want to account for as there will be no molding, so a perfect gap free fit is what you are after. The wall boards are in theory parallel, but in practice they won t be, but the jig I linked to is the simple solution to getting a gapless fit. Thank you BlueRidge, I watched it earlier and have it bookmarked. Will probably make that this weekend if I finally finish my dust collection ductwork. Here are some suggestions for you installation. Download the visual interpretation of the stair code. Your area code may be a little different but, it shows the national code. here is the link. Figure the correct rise for each step. find the finished height of your first landing. Measure from the finished height to the finished first floor and divide by the number by the number of risers . It should be 7 3/4” or less. Try to keep all of your treads as close to the height as possible. The visual code will show how much it can vary. Level each tread by using shims or wood screws. I would definitely pre finish with a stain and a floor finish that you can get at a flooring distributer. I would also make an extra tread and riser, maybe two. It is also important to check the moisture reading in the house and the shop and keep the finished treads in the house to acclimate. Install the treads with a good flooring adhesive that is not water based. I use Bostiks Best or Bostiks Pro Cure. In my area I am able to get the Bostiks Best in a caulking type cartridge. A five gallon bucket is around $200. On stair [and other] gauges, I use the telescoping legs from aluminum presentation tripods. I cut them to different lengths so I can use them on items of different widths. They allow me to cut precise pieces of laminate for cabinet interiors and so on. Jack Rigg thanks for the offer, will gladly take you up on that. I have done lots of framing, general carpentry and building small to large storage buildings etc, bit this will be my first attempt at stairs.